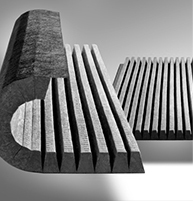 Multi-Groove is V grooved from high temperature board insulation product. Designed to be fabricated to different dimensions and still retain fire, water and thermal properties. It is designed to meet ASTM C547 standard up to 1200°F (650°C) and conforms to all specifications.